English clergyman and naturalist whose much-loved book, The Natural History and Antiquities of Selbourne, has been continuously in print since it was published in 1789. It contains his extensive, detailed observations of his region's flora and fauna. No authentic picture of White is known. The thumbnail image shown here is from an artist’s imagination for a mannequin representing White on display at Gilbert White’s House. Selborne is the secret, private parish inside each one of us. 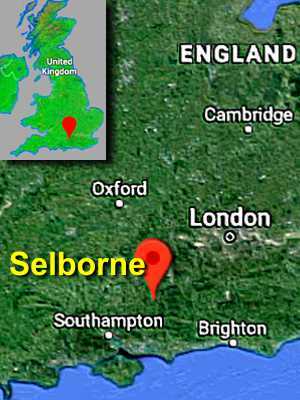 Alluding to the Hampshire village of Selborne about which curate Gilbert White wrote A Natural History of Selborne, one of the most frequently published books in the English language. The Naturalist in Britain: A Social History (1976), 51. 18 Jul - short biography, births, deaths and events on date of White's birth. 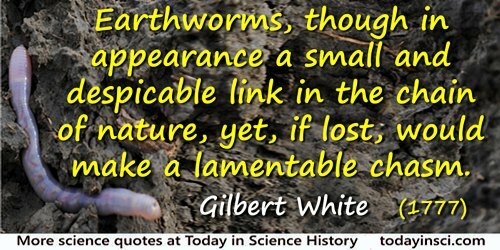 Gilbert White - short biography of the naturalist. Gilbert White of Selborne from Macmillan's Magazine (1893). The Natural History of Selborne, by Gilbert White. - book suggestion.